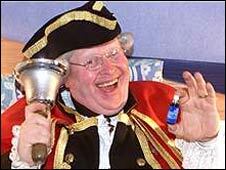 An old tradition has been revived in Gloucester by the town crier to celebrate the city's civic pride. A street parade is taking place on the anniversary of the end of the siege of 1643 when the city held out against Royalist forces during the Civil War. Town crier Alan Myatt, who organised the parade with Gloucester Civic Trust, said: "Gloucester has got something to shout about." The event begins at 1100 BST and starts outside St Michael's Tower. Mr Myatt said: "Gloucester is very much like an impressionist painting. "You get very close and all you see are daubs of paint but when you stand back you see a fantastic picture. "We want to flag up pride in Gloucester's heritage and history, whether it be civic, military, commercial, community or faith." A new flag bearing the city's crest has been specially made for the occasion. The march through the city centre takes place on Gloucester Day which was celebrated for hundreds of years but the tradition died out in the last century. The organisers hope the parade will again become a fixture in the city's calendar.